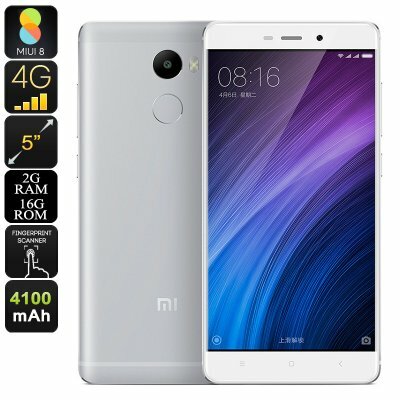 Successfully Added Xiaomi Redmi 4 Smartphone - 5 Inch Display, 2GB RAM, 4100mAh Battery, Octa-Core CPU, Fingerprint Sensor, Android 6.0 (Silver) to your Shopping Cart. Fully enjoy your favorite media, games, and mobile applications to their absolute most on the Xiaomi Redmi 4 smartphone. This Android phone comes packed with the latest hardware, guaranteeing a smooth performance and supporting all your mobile needs. Its MIUI operating system is a fresh take on Android 6.0, packing all the trusted features Android users are familiar with along with several other customization options – allowing you to use the phone exactly to your liking. With its stunning 5-Inch HD display it allows you to enjoy your media like never before. Enjoy vivid colors and stunning details – the Redmi 4 provides you with a truly cinematic experience from the palm of your hand. By packing a 64-bit Snapdragon 430 CPU this Chinese smartphone has been built to deliver a speedy performance. Along with this Octa-Core CPU comes 2GB of RAM, providing you with all the means necessary to engage in demanding multitasking sessions without needing to worry about slowing down your device. Whether you like to enjoy the most demanding games, movies, or applications – this Android smartphone handles whatever you throw at it. Additionally, with its Adreno 505 graphic’s unit, you can be assured that all your media will be displayed in stunning beauty and detail – guaranteeing that from now on you’ll take the absolute most out of your mobile entertainment experience. Supporting up to 128GB of external memory there will be oceans of space for you to store all your favorite games and media alike. This Dual-SIM smartphone supports two IMEI numbers, letting you take connectivity to an entirely new level. Being reachable on two phone numbers simultaneously allows you to efficiently separate work and private life. Additionally, it lets you simply slip in a foreign SIM card while traveling abroad, providing you with access to the local network while, at the same time, allowing you to stay connected to friends ad family back home with your trusted domestic phone number. Aiming to increase your connectivity even further, this 5 Inch smartphone supports both 4G connectivity and Dual-Band Wi-Fi – ensuring that no matter where you are, you will always be able to enjoy the fastest data speeds out there. From now on you will be able to leave your house with confidence as this beautiful smartphone packs an epic 4100mAh battery that is guaranteed to get you through the most demanding of days without needing to worry about battery life. While outside the phone’s 13MP camera allows you to snap absolutely stunning pictures, ensuring that you will always have the means necessary to snap and capture all these special moments in life in breathtaking quality. For those of you that really like to head deep into the unknown, the Xiaomi Redmi 4 supports an accurate GPS and Beidou navigation system, ensuring that you’ll always be able to find your way back to civilization. The Xiaomi Redmi 4 comes with a 12 months warranty, brought to you by the leader in Chinese smartphones as well as wholesale electronic gadgets..